The home inspection process is meant to protect you; it is there just in case there are any problems with the house. If there are problems, your Realtor® can try negotiate those repairs into the sale price. Now, sellers won’t fix every little bump and bruise in the home. So, just be aware that you may have to do some repairs and/or home maintenance yourself down the road. After the home inspection and negotiation of what the seller will repair, make sure to do a final walk-through of the home. I know this may seem tedious – but trust me, it’s not! You may find something you didn’t see during other walk-throughs of the home. Remember, this is meant to protect you. 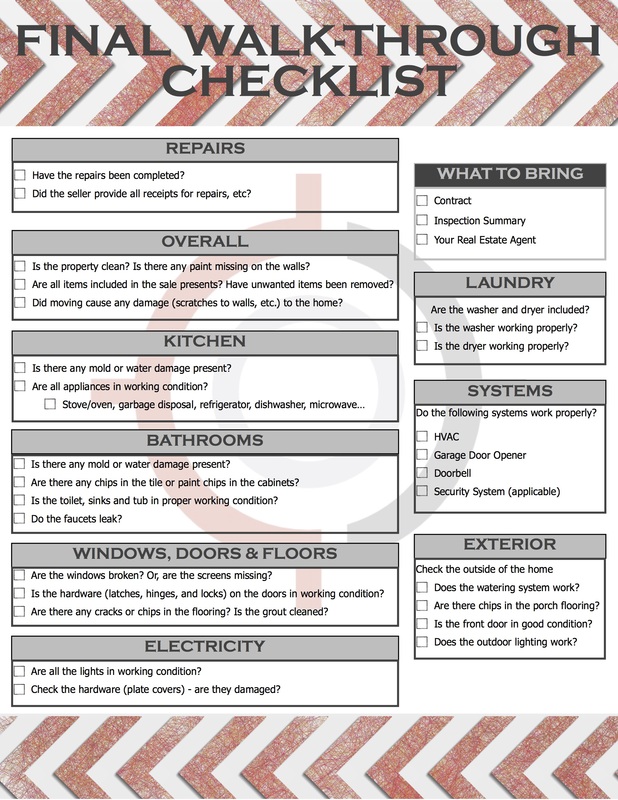 For this final walk-through, I’ve created a handy checklist for you to print out and bring with you. Make sure to check everything - from making sure the faucets don’t leak to checking if the grout is clean to making sure all lights are in working condition. This could be your new home, don’t skip steps! You may regret it down the road. Also, during this final walk-through, make sure all repairs the seller was responsible for were completed. You may want to hire a home inspector to do a re-inspection, or receipts from repairs performed may be adequate - it all depends on your comfort level. This is all an extra precautionary measure – you don’t want to dish out that money in the future, especially if that repair was agreed upon in the contract! Once you’ve done the final walk-through, signed the closing documents, and wired the purchase money – you’re all done! Once the official closing takes place you can move into your brand new home! Congratulations! You’re a homeowner!